One of the joys of visiting France is being able to drink reasonable quality affordable wine, often at half the price or less of the same wine back home. Now I love a good bottle of French wine for a special occasion but when I was living in France we decided, for everyday drinking purposes, to see how low we could go – could we get a bottle that was really pleasant for less than 6, 5, 4 or maybe even below 3 euros? I’m not talking about wine en vrac – I mean a bottle that you can buy at the supermarket that you could happily enjoy drinking with friends without feeling like a cheapskate. Something that didn’t make you feel worse the next morning (quality-wise, not quantity! ), something that you would recommend and reliably enjoy drinking again and again. I know it’s subjective, and that tastes and budgets vary but I’m going to share my experience and I hope to hear from others with their recommendations. I’m kicking off with a white wine that fitted the bill perfectly. Côtes de Duras. An AOC wine cultivated around the town of Duras in the Lot-et-Garonne. Our little how low can you go experiment seemed to show that it was easier to drink some quite quaffable red wines at 4 Euros and below (enormous variations!) but for white wine it was more of a challenge. The cheaper you go the thinner and more acid they seem to become. But the Côtes de Duras Sauvignon Blanc turned out to be a hidden star, a really nice crisp Sauvignon that was easily available and turned out a consistent wine year after year. At 4.50 EUR it proved to be a winner and I soon discovered we weren’t the only ones in our neighbourhood drinking it. 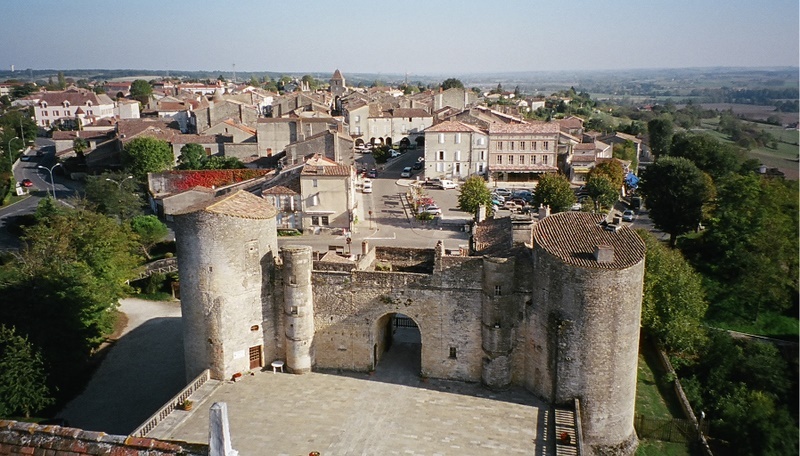 Strictly for research purposes I visited Duras – it’s a really pleasant hill-side town inland from Bordeaux and the Gironde, in that part of the Aquitaine which used to be Gascony. Apparently they have similar chalky soil conditions to Bordeaux though the climate is a little warmer. They produce reds and rosés too but I haven’t tried them – my boot was full of the Sauvignon. I’d love to hear from people in Aquitaine or other regions of France with their best local good quality favourites for under five euros – please leave your comments below. The vexed subject of cheap wine is a perennial issue, but after ten years in France and having sampled a pretty good selection of the local brews I think I can say that a weighty price tag is no guarantee of quality. The AOC label assures the provenance of a wine, but not the flavour or the bouquet. We have two house wines in our home, deep in the Cahors vineyards, and almost heretically, the first comes from the vast sunbaked fields of the Languedoc. You can buy it in almost any supermarket in France retailing at under €3 a bottle. An absolute bargain. A deep red with vanilla highlights, Roche Mazet Cabernet Sauvignon Pays D’Oc is best drunk young, but we’ve rarely had a bad bottle and we’ve tested it pretty thoroughly over the years! The second wine is a true gem and the opposite in almost every respect to the Roche Mazet. This is a luscious, fruity rose that I discovered by accident one day whilst hunting for a local wine for a charity hog roast. The vineyard is literally just up the road and run by the grandmother of a friend of my teenage daughter. I popped into the shed that acts a sales office to sample the vintage. Wow! A true summer classic. ‘We’ve just won a gold medal’, she told me proudly. So I bought umpteen cases for my charity do and stocked the cellar at the same time. Domain du Pech des Vignes Rose 2013 retails at €3.20 a bottle. An incredible price, because although it’s a Vin de Pays, it’s still a Cahors wine. This is a tiny place however and you won’t find this little treasure in the big supermarkets, but if you happen to be around Cahors way, hunt around, you won’t be disappointed. Can I cheat and propose the Lussac St Emilion (chateau Bonnin Pichon) which is usually €5.99 in Auchan but which does occasionally appear as a special offer if you buy a case of six which brings it into play? I’m a little biased as I do love nipping down to St Emilion and stocking up the car with different types directly from the vineyard – which is far more pleasant than traipsing round the Auchan in Cognac on a Saturday morning. However, whenever I see this particular bottle on “promo” I always buy a case or two. It’s perfect with a barbecued Cote de Boeuf, nicely charred on the outside but rare in the middle….